insured including a CNA certified nurses aide. Contact T.P.R for a consultation on home heath and care needs. At the T.P.R. Agency in Easton, PA, we are dedicated to the health and well-being of all ages of people. We offer affordable quality home health care for the healthy, seniors and those who are acutely or chronically ill. We are concerned with all aspects of your loved ones health; including the emotional, physical needs and support that are provided to clients and their family. All staff is insured and licensed by the state of Pennsylvania. Our company is looking for tender, personal, responsible staff. Nursing students, certified nurse aides, CNA students and home health aids (HHA). Apply here! What a gift TPR Agency was during my parents recovery!! Their service was absolutely perfect for my mom and dad’s needs. We would like to take this opportunity to thank you and your staff for the excellent care you have been providing for our parents since February. Living so far away and unable to with assist with their physical needs was very frustrating. The care that you provide is amazing! It is personal and full of compassion, patience and understanding. We also want to thank you for the updates you communicate to us which puts our minds at ease. With you and your staff we feel as if a family member is present. Thank you once again! Hello, my name is Joan Fisher. My husband Fred & I highly recommend Joan Brady & the TPR Care Agency staff for excellent home care. We both needed minor home care assistance daily for three months after getting out of the hospital. During this time, Joan Brady and the TPR staff came twice a day to assist, access and monitor progress. In the A.m. the TPR staff assisted with medication reminders, our daily hygiene routine, made breakfast and attended to our needs which included light household chores and laundry as needed. Besides assisting with our weekly medication boxes and reminders, TPR staff also went grocery shopping and picked up our medications at drugstore.The girls prepared lunch and made sure we were comfortable and safe prior to leaving us until returning for the P.M. shift. During the evening home health care visit, the TPR agency prepared dinner, administered medication reminders and helped us get ready for bedtime.They vacuumed and made sure we were set prior to leaving. All the TPR Agency staff were very caring, helpful and friendly. When my Mom became ill, a close friend (who is a hospice nurse) recommended the T.P.R. Agency. Fortunately, I heeded her advice. The aides are highly skilled, attentive and very caring. After the first few days they felt like family. Joan Brady is a wonderful advocate and organizer. She kept a close eye on my Mom’s condition, always looking for ways to comfort her and assist the family. This is exceptional care with a big heart. 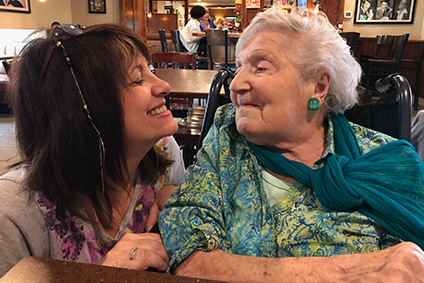 Several months ago it was decided that my 92 year old mother was not able to live alone any longer. So she moved in with me! While mom is able to take care of her personal hygiene needs there are areas that need to have concentrated care. Thankfully we have Joanie from TPR Agency for all the extras that I nor mom can handle. Joanie is not just an excellent health care provider but a friend who is considerate to mom’s emotional needs. We rely on and look forward to her visits, not just for health benefits but also comforting social time.